This month, with the help of our good friend Dennis Kruse, a document featuring a "potted version" of Mr Gretaux's life story and woodworking career has, at last, been unearthed. So far, we have only been able to bring you information on the Buchschmid side of the B & G partnership, so, with this important document we can at last shed some light on Mr Gretaux's input to the operation of the Buchschmid and Gretaux Wood Inlay Company. We have received a lot of inquiries regarding marquetry pictures that appear to be products of the Buchschmid & Gretaux Wood Inlay Company. Unfortunately, quite often it is the case that the marquetry pictures are actually copies of the B & G designs, or, they are made by other "wood inlay" or marquetry company's to their own unique designs. An example of the latter is the picture of "The Last Supper" you will see displayed on this page. The picture, which belongs to one of our visitors, could easily be assumed to have originated from the B & G company, but this picture actually comes from the French Marquetry Company "Spindler". The Spindler Company is still producing a range of superb marquetry pictures - and is now in its third generation of the family business. They have an excellent web site where you can view their current range of marquetry pieces. 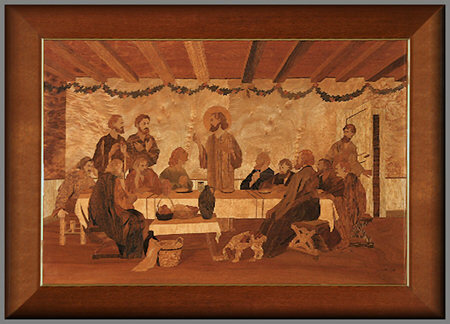 The web site address is available in the box below the Last Supper picture. Returning to the subject of identifying B & G marquetry pictures, there are a few pointers that will help you decide whether your picture is probably a B & G picture or not. The first thing to check for is the "BG" logo in one of the lower corners. It is a quite definite logo and is always very visible. B & G generally include a descriptive label on the reverse of their pictures. The company name and address can usually be found on the label along with a description of the picture. The back of the picture is always beautifully veneered and varnished - it should be decorative in its own right. If the back of the picture is left "unfinished" and has nails or screws protruding from it, it is most unlikely that it comes from the B & G company. Check the frame, this should fit flush and snugly around the edge of the picture. There should be no gaps or "spare land" between the picture edge and the frame. The above are general guidelines - and it is possible that you may find some B & G works that will vary from our text, but most should come somewhere within the above description. The artist, Jean Jaques Gretaux “B & G” was born in 1904 in Geneva, Genf Switzerland. After choosing the profession of becoming a "Cabinet Maker", he went on educational journeys to leading carpenter's workshops in France, Italy, Austria and Germany. Graduating as a “Master of the Guild” he used his skill to produce exclusive pieces of furniture in combination with the medieval art of marquetry. His first engagement abroad (1928) was to inlay a gigantic “Lion of Judaa” into the parquet-floor of the reception-hall in the Emperor’s Palace in Adis-Abebba (Addis Ababa) / Ethiopia, which was later used as a museum. By completing this mission, Gretaux gained international reputation which resulted in getting orders for other projects requiring the precision of Gretaux’s hands. WW II discontinued all planned and projected activities in his field completely. J.J. Gretaux changed over to miniature objects and specialized himself in delicate and intricate wood-inlaid presentation, whereby he was gaining fame and recognition. He created a large variety of designs ranging from figurative to architectural motifs. To many connoisseurs (E.J. Hoover, Trudeau, Msg. Spellman a.o.) Gretaux’s work of art, marked with an inlaid initial “BG” – became the embodiment of perfect handmade inlaid art-work with the highest standard of workmanship possible. At the age of 81 the last great master of this bygone art, symbolizing creativity, precision and perfection of the past, left us. Click the above button to return to page 7 of "Can You Help"
Click the above button to visit page 9 of "Can You Help"